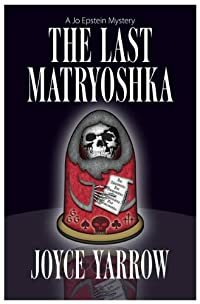 The Last Matryoshka by Joyce Yarrow, a Mysterious Review. Review: When PI Jo Epstein's stepfather Nikolai is framed for murder, he hires her to find the person responsible … but refuses to give her any particulars from his past on why someone would want to blackmail him, in The Last Matryoshka, the second mystery in this series by Joyce Yarrow. The murder took place in the elevator of the building in which Nikolai and Jo's mother Ruth live. Worse, Nikolai isn't exactly innocent: he did indeed shoot the man, though he was already dead when Nikolai was forced by an unknown assailant to shoot him again in the head. The killer took the gun — with Nikolai's prints now on it — and is now sending him blackmail notes enclosed in rare matryoshka, Russian nesting dolls. Using her network of contacts, Jo obtains the identity of the dead man … but fails to come up with a connection to Nikolai or a reason why someone would want to kill him. And then, unexpectedly, Nikolai flees to Russia, leaving Jo no choice but to follow him there — if only to learn what it is in his past that terrifies him so much in the present. There isn't much suspense in The Last Matryoshka as the reader is aware of pretty much everything that is happening from both the perspective of Jo Epstein and the killer/blackmailer … with the sole exception of the reason for why Nikolai is being blackmailed. As resourceful as she is, following Jo around New York tends to wear a little thin after a while, though the action picks up significantly when she hits the ground in Russia. The storyline tends to unfold in much the same way the nesting dolls reveal more detail — or an unexpected find — as they are opened, an interesting tie to the book's title. Still, one can't help but wonder if The Last Matryoshka would have been more compelling had there been more — for lack of a better word — mystery to the plot. Acknowledgment: Joyce Yarrow provided an ARC of The Last Matryoshka for this review.